Ritesh Malik, father, husband and a spirited entrepreneur, is the first-generation immigrant to Canada, born into an illustrious business family. 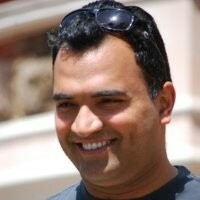 He became a global relocation and logistics professional after graduating from Delhi University and a master’s in business administration in global marketing, and successfully executed a challenging assignment of establishing footprint of O’Neil Software, world’s leading off-site records/information management software company in Asia, Middle East and Africa. Since early 2000, he is a partner in Om Logistics, a leading logistics company of India, helping expand their international operations into China, Japan and North America. He is a director in OmTrans Logistics, the group’s international division and is engaged in setting up a trading division to exploit the true potential of trade between North America & India. A versatile entrepreneur, Ritesh has successfully diversified into real estate development (TFS Holdings), human resources and public relations (The Final Score). An avid sports lover and firm believer of giving something back to the society, Ritesh helped Indian cricket star Yuvraj Singh to start his cricket academy – the Yuvraj Singh Centre of Excellence, and played a key role to kickstart his cancer charity, YOUWECAN. Ritesh and his wife Ruchi, are parents of two daughters, Bhavya and Aanya, a son Soham. A firm believer in being one with nature and understanding one’s inner being to achieve one’s true potential, he advocates yoga, ayurveda, nature cures, natural/organic foods and a stress-free healthy lifestyle as a panacea for the newer generation and goal for remaining life.